Why do tourists find one country cheap and another expensive? Why don't exchange rates move in a manner that allows a consumer to pay effectively the same amount for a set of goods, wherever he buys them? How does PPP help explain and quantify this? And what relevance does PPP have for us to understand long term direction of our exchange rate? Read on as Saturday School explores this issue and its relevance to financial advisors in India. Why does an American tourist find India inexpensive? When an American tourist visits India, he is often amazed at how inexpensive things are in India. The taxi fare from the airport to the hotel costs him Rs.350 - he mentally converts this into dollars @ Rs.62 to a dollar and lets out a low whistle - less than 6 bucks! He would have paid at least 4 times this amount back home for the same distance. The same tourist goes to London the next week, and has an opposite experience - UK is so much costlier than back home, he thinks. And when his travels take him to Paris, he has reason to grumble even more - France is costlier than even UK - and so much more expensive than back home in the US, he thinks. As a consequence of the short and medium term forces of demand and supply, exchange rates often move away from the "equilibrium" level which they ought to be at. The equilibrium rate of exchange between the US dollar and the Indian rupee, at which level you can buy the same basket of goods and services in both countries, is called the purchasing power parity level (PPP). That's the level at which the consumer's purchasing power is at parity, in both countries. For example, if a given basket of products costs US$ 1000 in USA and the same basket of products can be bought in India for Rs. 30,000, the PPP rate of exchange will be 1 US$ = Rs.30. In China, you need only US$ 57 (at current exchange rates) to buy you the same representative basket of products that will cost US$ 100 in USA. Likewise, in India, you need only $29 to buy the same basket of goods. So, an American tourist, who is shopping in India, will exchange $100 for rupees, get Rs.6200 in return (assuming an exchange rate of 1 US$ = Rs.62) and be prepared to spend the entire Rs.6200 on buying products that would cost him $100 at home. He will however be in for a pleasant surprise when his bill adds up to only Rs.2900. He takes back the products and also converts the balance Rs. 3300 back into US dollars : which means products worth $100 plus $53 in cash (3300/62) for $100 that he spent in India. No wonder American tourists say India is cheap! An American tourist will however need $109 in UK to buy the same products that cost him $100 back home : shopping in UK for a US resident is obviously not such a smart idea. Likewise with France, Germany and Japan. How is this relevant for us? There are two angles that are very useful for financial advisors in India to absorb in this context. Economic theory suggests that in the long run, the actual (or nominal) rate of exchange will move towards the PPP level, even if short and medium term factors have caused it to deviate from the PPP levels. Is 1 US$ worth Rs. 62 or Rs. 18, or something in-between? Using the above data table, how can we find out the PPP exchange rate for INR vs US$? We know that today, 1 US$ fetches Rs.62. We also know from the table above that US$ 100 in USA buys the same goods that you can pay $29 in India. $29 today is worth 29*62 = Rs. 1,798. 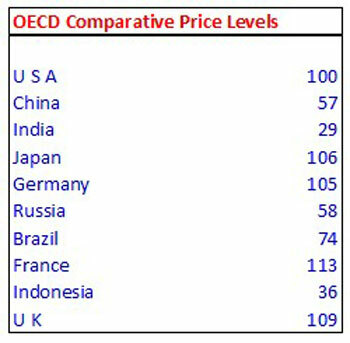 So, in PPP terms, very roughly, and based only on the OECD table, you can say that US$ 100 should be equated with Rs. 1,798 (say Rs.1800) - in other words, 1 US $ = Rs.18 in PPP terms. Contrast this with the actual exchange rate of 1 US$ = Rs.62, and you will see the magnitude of the gap between what economic theory suggests as a long term equilibrium and today's reality. There are of course a number of holes that have been poked by experts into the PPP theory, some of which revolve around comparing apples with oranges. Representative goods in US and India for an average consumer are vastly different, living standards are vastly different - all of which makes a straight forward comparison quite challenging. Then there are different rates of import duties and local taxes that skew prices in different countries. That said, the broad point is that the PPP exchange rate does indicate that the rupee is significantly undervalued at present, versus the US dollar - in terms of its ability to buy you a certain standard of living. We have a number of structural challenges, like our fiscal and current account deficits - which keep demand for the US$ high in India and therefore make us pay higher and higher amounts of Indian rupees to buy the US dollar. One can argue that if and when these structural imbalances get rectified, the rupee has significant scope for appreciation - based on its PPP levels. 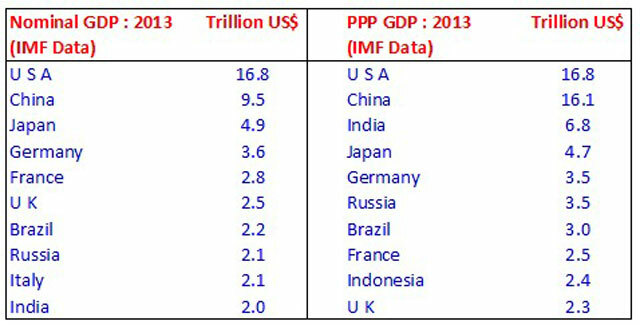 On a PPP basis, India is the third largest economy in the world and China is already the size of the US. India's economy on a PPP basis is already larger than Japan and Germany - which are otherwise seen as economies that are twice our size. For international businesses, the Indian market - at the third largest in terms of purchasing power parity - is just too large to ignore. A comparison between the two tables gives an international business a clear perspective of just how large and important India as a market will become, if structural reforms can arrest a sliding rupee and put it on course to come even half way close to its PPP rate of exchange. Do you have any observations or insights or perspectives to share on this issue? Did this help you understand the topic better? Do you disagree with some of the observations? Please post your comments in the box below ..... it's YOUR forum !